Bùi Quang Ánh was born on 4 November 1940 on Trần Hưng Đạo Street, Hơn Kiến District, Hanoi. His grandmother was from a wealthy family, making a fortune selling incense sticks along the Yangtze Rive in China. His maternal grandfather, although an intelligent man, died in 1950 (approximately 50 years old) early in Ánh’s life from tuberculosis. Due to the generosity and kindness shown to him by his grandmother, Ánh developed a warm character that showed in his future relationships and artwork. Ánh was born into art, as well as war. 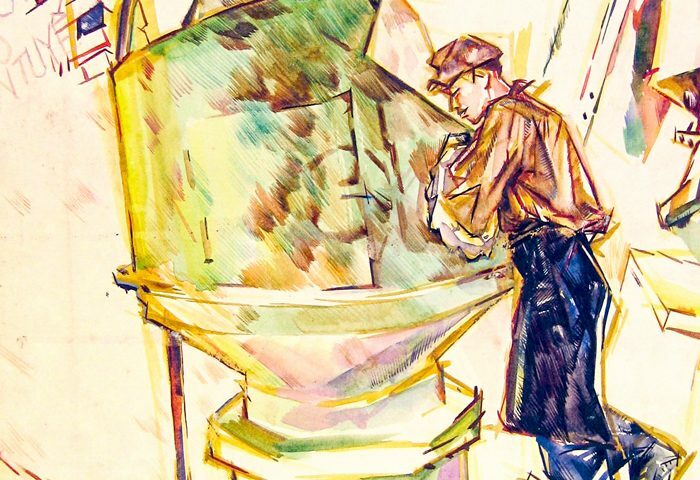 His father, Bùi Huy Triều (1911-2004, a native of Gia Lộc District, Hải Dương Province, and later a member of the Communist Party of Vietnam), drew over two thousand paintings of Vietnamese customs. Triều worked as a secretary for the French tax base in Vietnam from 1940 to 1945. At the outbreak of the First Indochina War, Triều became chairman of the resistance administrative committee for Gia Lộc District. Ánh’s earliest memory dates back to 1945, when he was just five years old, at the beginning of the Anti-Colonial War. As the killing of what would total over two million people began in Vietnam’s northern delta provinces, Ánh remembers dead bodies heaped together and sprinkled with lime powder to prevent the spread of disease. Despite witnessing these horrors at such a young age – or maybe because of it – his work emphasises beauty, no less the need to fight for it. Also as a result of the First Indochina War, Ánh and his family moved out of Hanoi and into the countryside on three separate occasions between 1946 and 1950. Ánh recalls, however, as a young boy, these were some of his happiest times, where he rode buffalos and flew kites – rare activities for a boy from the city. On one such occasion between 1948 and 1949, Ánh’s family moved to Phù Kế village in Thanh Miện District, Hải Dương Province, where he attended primary school. Here he met “Brother Teacher (Anh Giáo)”, who recognised Ánh’s talent and grew to adore him, taking Ánh into his home three kilometres from Phù Kế village to Phương Khê village for a short time. He taught Ánh the flute, the piano and drawing. Ánh’s mother sent them rice so that they could both eat as a form of payment for the teacher’s dedicated tuition. While being taught by “Brother Teacher” at the age of nine, he drew portraits of resistance fighters in ink and later studied drawing from the age of fourteen at middle school. Ánh was the only member of the family to take up painting and art. When he and his family moved back to Hanoi for the last time in 1950, Ánh enrolled in two different private art classes at Khai Trí Tiến Đức School on Hàng Quạt Street in Hanoi. From 1954 to 1956, Ánh studied oil painting for two years under Nguyễn Tiến Chung, a friend of legendary Vietnamese artist Tạ Tỵ, where Ánh learnt different artistic styles. Then, from 1956 until 1958, Ánh moved to study under Lương Xuân Nhị, where he learnt more about basic fine art knowledge and practised realism. In 1956, Ánh continued his studies, heavily influenced by the style, and under the mentorship of, Lương Xuân Nhị. These classes were provided altruistically without charge and did not hold any official qualifications. However, Ánh continued to bring his artworks to the classes for independent appraisals and advice. Nguyễn Tiến Chung taught in the morning and Lương Xuân Nhị taught in the afternoon. By 1958, while attending Chu Văn An High School, he had produced oil paintings with national recognition. At age of 16, his still life work Dahlia Flowers (Hoa Thược Dược) was displayed in the 1958 National Fine Art Exhibition. In the same year, he held an exhibition of twelve oil paintings of which one was given to the first President of Indonesia, Sukarno, on his visit to Vietnam in 1959. Also, during his high school years, Ánh worked with the Aluminum and Bronze Production Company Ngũ Xá (Cơ sở đồng nhôm Ngũ Xá) that made awards for the school. As a result of this collaboration, he designed embossed portraits of Hồ Chí Minh and Lenin. 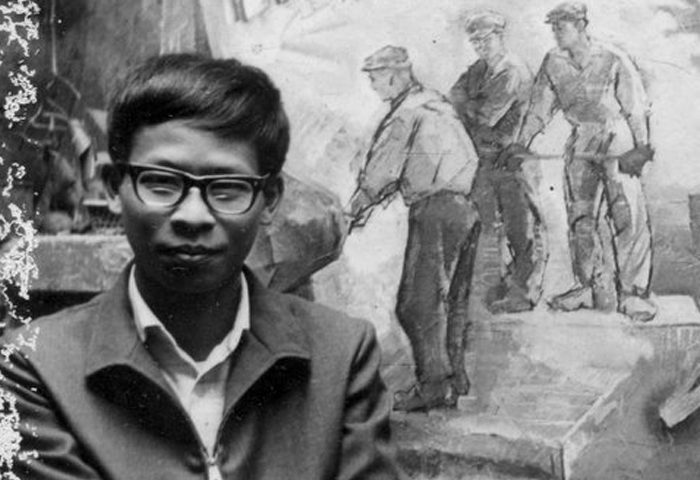 After Ánh graduated high school in 1959, Ánh wanted to enrol in the Vietnam Fine Arts College. However, what he described as his “capitalist family” refused his request and got him a job with the Vietnam Film Studio in Hanoi through his uncle, who worked for the Ministry of Culture (Bộ văn hoá). The film studio predominantly made films for the peasantry, who did not like fast moving films but slow imagery, which they could understand better. This was perfect for Ánh’s discipline as a painter. Until 1963, in his role as a painter for the studio, Ánh travelled extensively in regions dominated by ethnic minorities, field trips that he made by bike endorsed by local governments. Interestingly, he also worked alongside Tô Ngọc Vân’s widow at the Vietnam Film Studio, who worked in the studio’s dark room. In 1963, he was admitted to the Vietnam Fine Arts College, which resulted in a turbulent three years. Seen as a promising talent and top of his class in his first year, Ánh began to explore artists such as Cezanne and Picasso in his second year, angering most of his teachers and classmates, including Phạm Thanh Tâm. When he made a Cubist-inspired painting after a field trip in his second year, he was given a warning in front of the whole college as a reprimand. In his third year, after continuing to research contemporary Western artistic styles such as Rembrandt, Ánh was expelled from the college in 1966. After his expulsion, until early 1968, both Ánh and Phạm Đỗ Đồng were sent to work for Ty Văn Hoá (the Cultural Department) in Lạng Sơn Province at the request of Trần Đình Thọ, principal of the Vietnam Fine Arts College, and Vũ Hiền, Secretary of The Party (Bí thư đảng uỷ) of the College – a role which Ánh assumes was meant to get rid of him permanently. 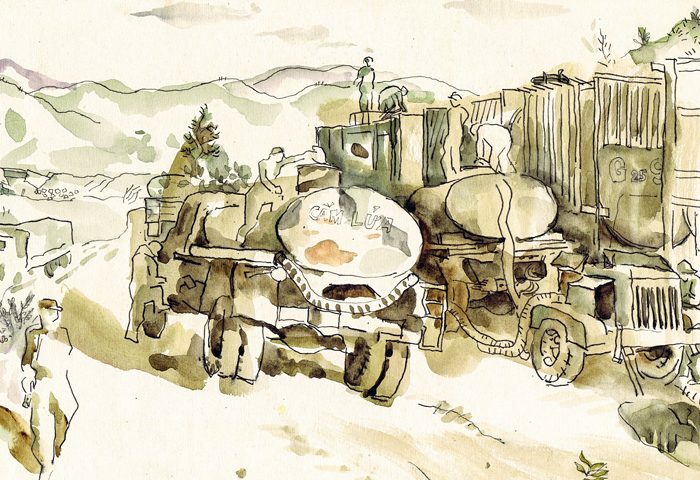 He was tasked with documenting the resistance war against America, making sketches and paintings of daily life in the region. An exhibition was held for him in a cave in Lạng Sơn Province, after which a number of his paintings were collected by the Vietnam Fine Arts Association. Despite enjoying his time in Lạng Sơn Province, using the library there extensively, Ánh wished to return home. In early-1968, Ánh faked a medical certificate relieving him of his duty and returned to Hanoi. In 1968, the Vietnam Fine Arts College was transformed into the General Department of Logistics for the war effort during the Second Indochina War, at the same time housing some of Vietnam’s most iconic and interesting artworks. 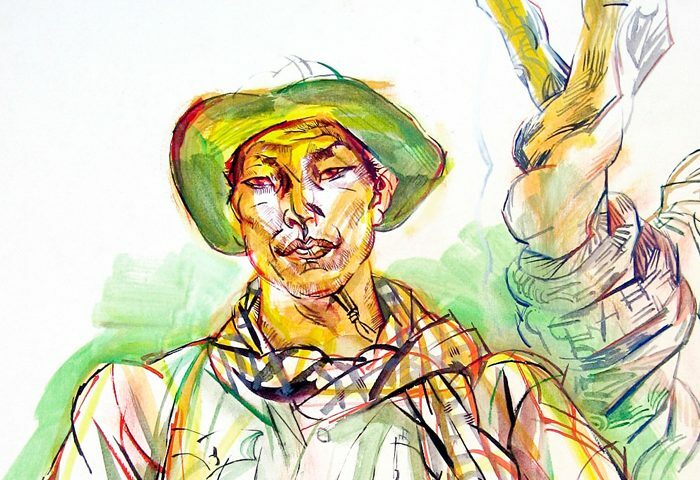 Despite being expelled from the Vietnam Fine Arts College, Ánh started work for the political arm of the General Department of Logistics on the recommendation of his brother-in-law, assigned to travel the country and document the war through painting. Ánh started in late-1968 by travelling to Savannakhet Province in Laos along the Ho Chi Minh (Trường Sơn) Trail, painting military equipment, goods and famous locations such as the Đồng Lộc crossroads, a horrible route on the Ho Chi Minh Trail in Hà Tĩnh Province. One of the paintings he made during this time, 13th Kilometre of Trường Sơn trail, was insured for $500,000. Ánh continued to make numerous trips from Hanoi along the Ho Chi Minh Trail throughout his career as a war artist. In 1970, Ánh travelled to The East Village (Bản Đông), where all wounded soldiers from Quảng Trị Province were sent for treatment. He visited many artillery units and the cave hospital in Bản Đông. He did not witness these things in his first trip along Ho Chi Minh Trail. Later, in April 1970, Ánh travelled with poet Phạm Tiến Duật and arrived at soldier station 5 (binh trạm 5). While at station 5, Ánh caught a severe bout of malaria, leaving him delirious and close to death. He recovered after a week and, once again, returned to Hanoi. In 1975, Ánh followed the Delegation of Economic Exploration of The Central Highland (Military Supplies Department) heading to South Vietnam. On his way, he met the Board of Commanders of the Ho Chi Minh Campaign, including Đinh Đức Thiện and the People’s Army of Vietnam (PAVN) General Văn Tiến Dũng. He also visited the troop’s station of the commander’s board in Bù Đốp. Ánh spent many of these excursions with film-maker Nguyễn Trung Tự, who even supported him financially when he was ill with malaria. In addition, Nguyễn Trung Tự took Ánh’s paintings back to Hanoi for the first exhibition of artworks sent from South Vietnam at the Unification (Thống nhất) Club, near Sword (Hoàn kiếm) Lake in Hanoi. At this exhibition, the widely travelled but notorious art critic Tố Hữu complimented Ánh’s paintings. Together with Nguyễn Trung Tự, Ánh travelled to Nha Trang city, the Battle of Núi Bà Đen in Tây Ninh and finally to Saigon for liberation. During the Second Indochina War, like most artists in Vietnam at the time, Ánh used materials from Germany, the Soviet Union and China. Ánh was fortunate, however, in that he rarely had to scrounge. In his early days as an assigned painter in Lặn Xuống, part of his responsibilities was to distribute art materials among the locals on behalf of the Cultural Department. Then, when he was working for the Political Department of the General Department of Logistics, all he needed was a check and a form to buy materials from the Ministry of Culture Bureau to buy good quality paper and oils. Sometimes he bought so much that he needed a tricycle to transport the materials. From October 1977 he taught at the Hanoi Industrial Fine Arts University until 1981, where he taught art anatomy classes. Ánh’s notable colleges at the University included Lê Thị Kim Bạch, who taught socialist painting, and Nguyễn Trọng Kiệm who was an avid follower ofTô Ngọc Vân. In 1981, Ánh moved to Ho Chi Minh City where he was granted a small apartment in Trần Hưng Đạo Street. His decision was based on the intense political air in Hanoi after the war and the more liberal arts scene that emerged in Ho Chi Minh City when the country opened up. He first started working for the Bình Tây Water Supply Company (Công ty cấp nước Bình Tây). Although to offset his meagre salary, he held a number of other jobs: making portraits, overseeing cultural decorations, painting for the Agricultural Ministry and drawing comic books for Kim Đồng Publishing House. Also, the Industrial Fine Arts University had a campus in Ho Chi Minh City, so he once again taught anatomy art classes at the university. This period of his life, from 1981 to 1986, is an interesting one. His subject focus shifted to the materialistic nature of life in Vietnam as the country finally started to reap the economic benefits afforded by peacetime and economic reform (đổi mới). Using his love of abstract expressionism, Ánh looked to tackle the subject with his own sense of worry over what modernity and materialism truly meant to a population largely unaccustomed to either. Ánh retired from the Industrial Fine Arts University in Ho Chi Minh City in 1987 but continued to work as an independent artist. During this time, Ánh painted and produced a number of works. Until 2004, he once again turned his attention to war. Anh produced hundreds of thematic works on the disintegration of the communist system and a study of the Gulf War involving Iraq and the Saddam Hussain regime. Bùi Quang Ánh lives in Ho Chi Minh City. 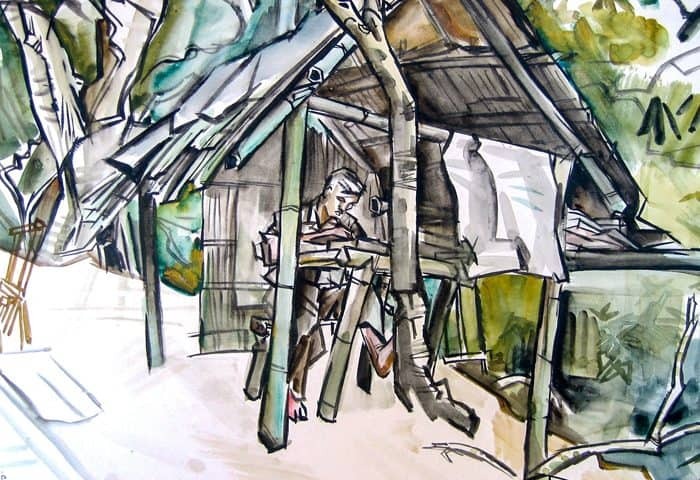 Bùi Quang Ánh, 1971, Savannakhet, Laos, "Hầm Công Binh (Engineers' Shelter)." Watercolour on machine-made paper. Bùi Quang Ánh, 1968, near Savannakhet, Laos, West Trường Sơn Trail, "Trường Sơn K32 (Trường Sơn K32/Kilometer 32, (Ho Chi Minh Trail)). Watercolour on machine-made paper. Bùi Quang Ánh, August 1968, on the Trường Sơn Trail between Quảng Bình and Laos, "Crossing center point Kilometer 12, route 12." Watercolour on machine-made paper. Bùi Quang Ánh, 1968, Trường Sơn mountains. "Chiến sĩ công binh trở về hang (Engineers return to the Cave)." Watercolour on machine-made paper. Bùi Quang Ánh, 26 December 1968, "Chuyển hàng ra tiền tuyến (Goods Transport to the Front/Transporting Goods to the Front)." Watercolour on machine-made paper. Bùi Quang Ánh, 26 October 1968, Ho Chi Minh Trail, "Chuyển xăng (Petrol transport/Transporting gasoline)." Watercolour on machine-made paper. Bùi Quang Ánh, 1970 or 1971, Ta Le Savannakhet (Hồ Chí Minh Trail), "Tổ trinh sát của D33 Công Binh Anh Hùng Đường Quyết Thắng (Reconnaissance Squad of Battalion 33, Heroic Engineers on the Ho Chi Minh Trail)." Watercolour on machine-made paper. Bùi Quang Ánh, 15 March 1975, the East Forest in Phước Long, an old province of Southeast Vietnam, "Đất rừng miền Đông (The East Forest." Watercolour on machine-made paper. Bùi Quang Ánh, 1970, Ho Chi Minh Trail at Savannakhet, Laos, "Khắc gỗ báo Trường Sơn (Wood carving newspaper Trường Sơn)." Watercolour on machine-made paper. Bùi Quang Ánh, November 1968, Linh Cảm river crossing, near Vĩnh in North Vietnam. "Gặp đc Nguyễn Văn Báo; Đc Trung Quốc; 20 năm trong quân đội NDVN; Chiến sĩ lái xe đoàn D752 C86; Phà Linh Cảm (Meeting comrade Nguyễn Văn Báo; Chinese driver comrade; 20 years in the Vietnam People’s Army; Driver soldier Battalion 752, Company 86; Linh Cảm ferry)." Watercolour on machine-made paper. Bùi Quang Ánh, 1971, Yên Bái Province, "Tất cả cho tiền tuyến (All for the front)." Watercolour on machine-made paper. Bùi Quang Ánh, 1968, Ho Chi Minh Trail, "Km32 đường Trường Sơn (Km32 Trường Sơn Trail)." Watercolour on machine-made paper. Bùi Quang Ánh, 1971, Bản Đông (East Mountain Village, on the border of Savannakhet, Laos and Quảng Trị Province, Vietnam), "Bản Đông (At Bản Đông)." Graphite pencil on machine-made paper. 1992-1995 – Annual group exhibition of professors from the Hồ Chí Minh Fine Art University at Saigon Tourist and Press Club. Bùi Quang Ánh, Ho Chi Minh Trail- Hồ Chí Minh Campaign-Military Logistic, Exhibition Catalogue, Self-published. Nguyễn Kim Loan, Bùi Quang Ánh – Artist of reality and dream – Mỹ thuật No.88.